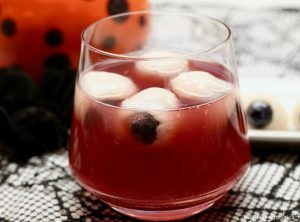 You are here: Home / Entertainment / Spooktacular Halloween Cocktails!! 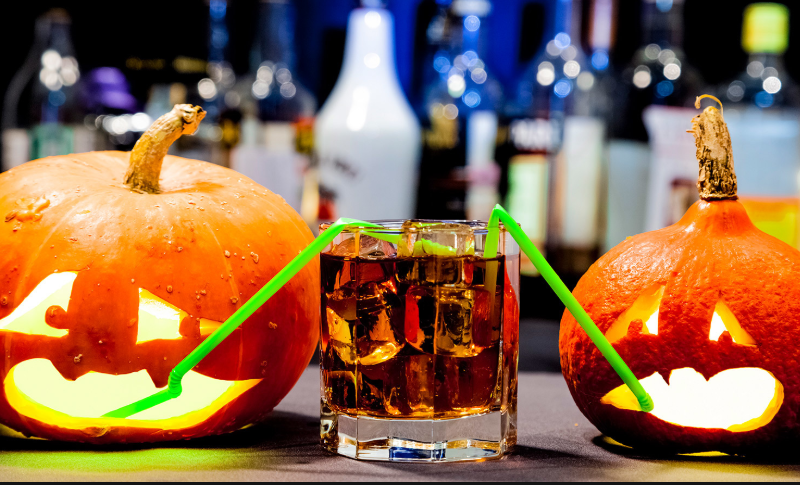 Looking to bring that little extra zing to your Halloween festivities? Well, look no further! 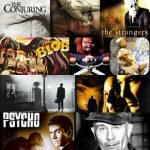 We have compiled a list of our favorite haunted beverages that will be sure to leave your guests wanting more. In a small bowl, mix corn syrup and green food coloring. Tip- start with a small amount of food coloring and keep adding until you get the desired color. A little bit of food coloring goes a long way. Dip your margarita glasses upside down in the bowl so that the slime runs down the sides. Place the glasses in the freezer to allow the slime to set. Juice the limes in a strainer and pour into a pitcher. In the same pitcher, add Triple Sec and tequila. Add some ice and stir together until the mixture is cold. Spoon 1 Tsp of the cherry juice into the bottom of each glass. Stick one cherry on a cocktail stirrer and add it to the glass. Carefully pour the margarita mix into each glass. My advice is to hold a spoon in the glass and pour gently so that you don’t disrupt the syrup on the bottom of the glass. Top each glass off with the Seltzer water and serve. Place one cherry inside each Lychee fruit to look like an eyeball. Place one “eyeball” inside each compartment in an ice cube tray. Fill the compartments with sparkling water and freeze. In a punch bowl, stir in fruit punch, pineapple juice, and Cherry 7-Up. Before serving, float ice cubes in punch. Add 1 cup boiling water to the yellow gelatin in a container with a spout. Stir until completely dissolved. Stir in some yellow food coloring until you have the correct color. Pour mixture into each shot glass until the glasses are 1/3 full. Refrigerate until set. Add 1 cup of boiling water to orange gelatin in your spouted container. Stir until dissolved. 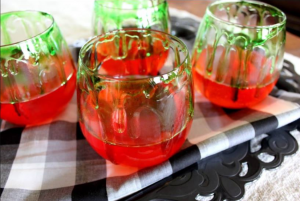 Stir in Schnapps, red food coloring and then a few drops of yellow food coloring. Refrigerate until set. Pour your vodka or clear liquor into the spouted container. Sprinkle unflavored gelatin over the top and let stand 2 minutes. Add the remaining 3/4 cup boiling water and stir until completely dissolved. Stir in condensed milk. Pour this white mixture over the firm orange layer. Refrigerate for 2 hours or until firm. You can top with Cool Whip and sprinkles or serve them as they are. Shake the lime juice and vodka together in a shaker and strain it into a shot glass. Using your eye dropper, add a few drops of Bailey’s to the top of the shot. 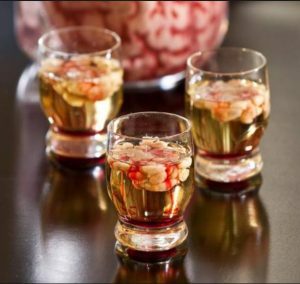 The Bailey’s should curd a little, giving the creepy, gory effect of brains. 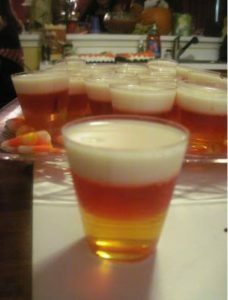 Add a splash of Grenadine for the blood effect and enjoy! We hope you enjoy these recipes and we look forward to hearing your stories in the comment section. Previous Post: « Best Ever Pumpkin Carving Tricks!